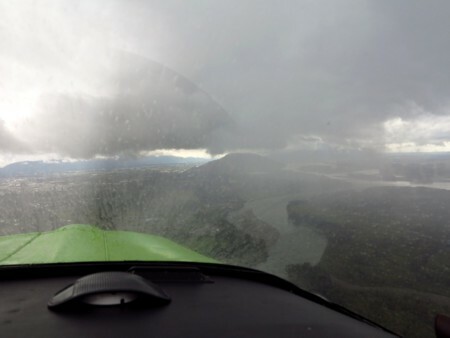 Poor weather procedures, scud running! The weather was flyable again on the Saturday and Mark came over to pick me up from Richmond... The objective was to perhaps fly the Maule, but I suggested the Tomahawk was closer, and that Mark could have a change from the amphib. After lunch at Boundary Bay we decided to go east in the Tomahawk into the poorer weather to Chilliwack where my brother was returning Nick's Cherokee after its annual check. 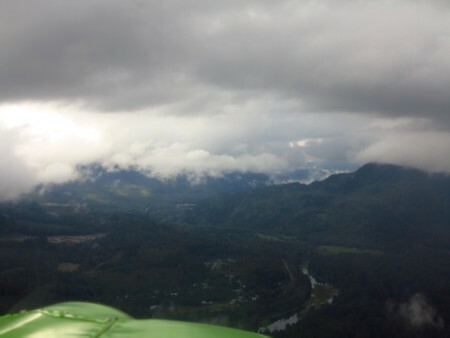 There was the opportunity to experience flight in poor mountain weather while having an easy safe exit. 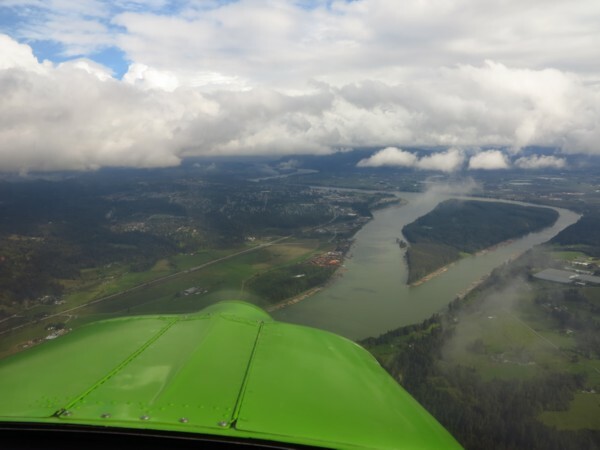 Matsqui Island with Mission ahead. 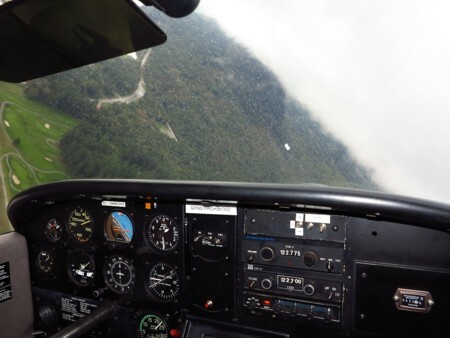 If you have a gap in the clouds to navigate you should treat it the same as an uncertain mountain canyon, slow down, apply flap as necessary for a view ahead, and be prepared to to a quick turn before entering cloud. Entering cloud in mountainous areas is deadly hazardous. What I have noticed is a tendency for the pilot to dive the aeroplane at high speed to get below the cloud. This is hazardous as you will come out the bottom with a lot of energy, and a reduced time to react to an obstacle ahead. Better to slow down, and have more time to see, assess, and respond. 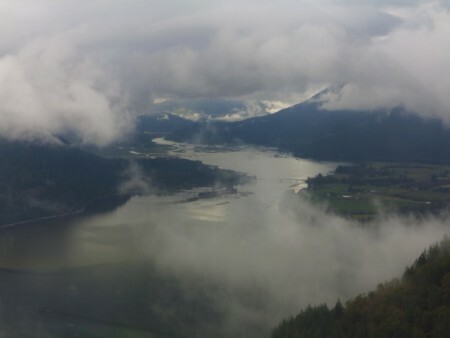 Before I arrived back in Vancouver I received an email from a friend asking me to contact him the next time I was here. 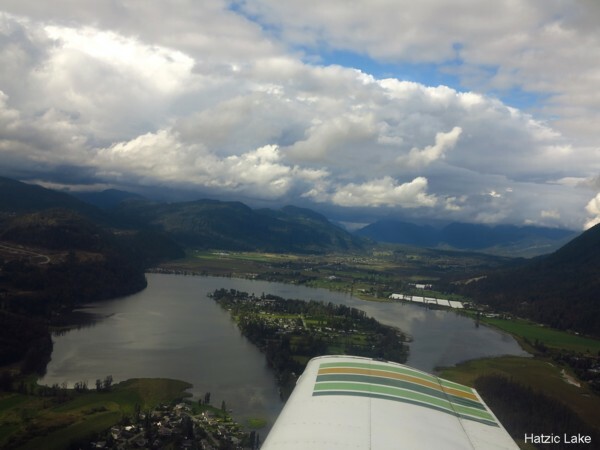 Unfortunately he was flying his RV6A from Edmonton to Chilliwack a couple of weeks ago and disappeared. They called off the search after a few days. Safety in the mountains in these changeable weather conditions is very much on my mind. Typical scud running conditions but with outs. 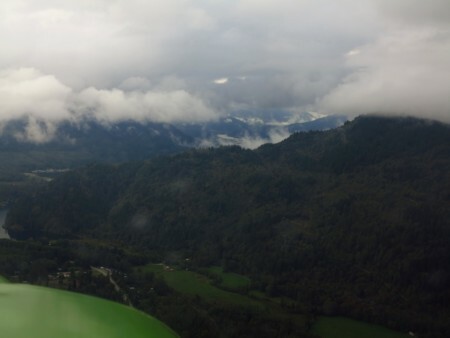 Heading towards Rowena's, Harrison Mills, with Chilliwack Mountain on the right capped in cloud. We saw a Cessna 172 heading westwards here, landing light on for good visibility, but not responding on the local frequency 122.775. 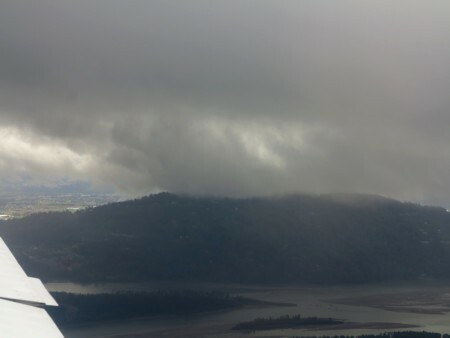 Simulating the arrival at a possible diversion field such as Rowena's. Practicing steep turns 'Canyon' style. The popular way to do a canyon turn here is to slow down power off, apply full flap, and bank steeply while applying full power... A very serious situation indeed! I prefer to be slowed down before I approach a perilous unknown valley. 2,000 RPM, first stage flap, and 70KIAS works well for the Tomahawk. And if you have to, forty five degrees bank and a little more power produces a turn radius well within the bounds of a valley you should dare to enter. If you get into poor vis your eyes may go into their rest focus, i.e. on the windscreen. 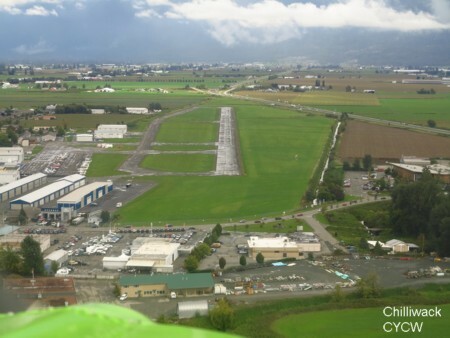 We stopped by Chilliwack for 45 minutes and then headed back. Divert and land somewhere and the weather will be like this later on. Far more comfortable. After departing Chilliwack we contacted a Bell 212 helicopter operating north of Chilliwack on 122.775, we had sight of each other. Then we spotted a Cessna 172 going eastbound, with its landing light on, but not communicating on the common frequency. I switched and tried Chilliwack's frequency, no response there either. 'Advised the Bell 212 of this possible conflicting traffic. Today's Tomahawk snag was an increasing burning smell, was it from the city of Mission? A wisp of smoke from the vent on the combing confirmed electrical fire though the load meter did not show excessive electrical consumption. Master switch off, avionics master off. and we watched for the smoke to dissipate and the smell to go. The 'fire' obediently went out. Then I turned all equipment switches off. I decided not to investigate the problem but to continue back to Boundary Bay. Mark checked the ATIS on his mobile phone, and as we approached the Courthouse arrival point we put the master switch on, the avionics master on, and I turned Com 2 on. Each action while looking at the load meter. Com 2 worked, there was no further fire concern, and Boundary Bay Tower allowed us into the airspace without a transponder. 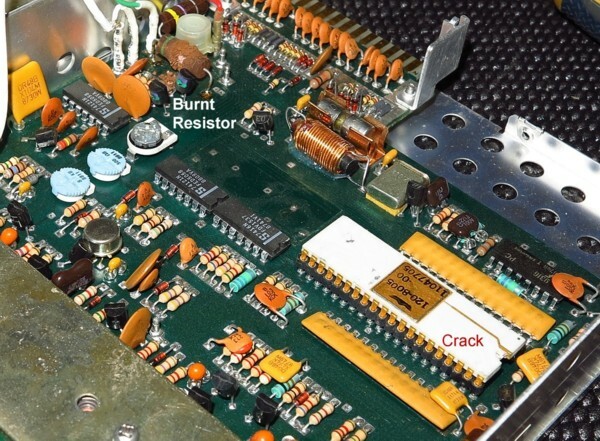 Transponder: Apparently the "Crack" is normal, but the resister burned out. This may be the cause of the electrical smoke.